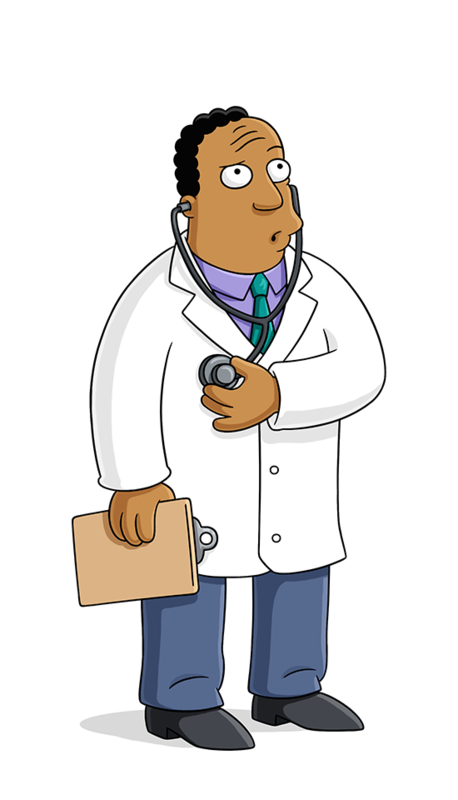 Simpson family physician. When Homer disgraces himself at a party, he advises Marge that if she wants Homer to live, she had to get him in bed, roll him over on his side and keep him calm. "Remember," he says soberly, "I said if you want him to live." Has also been known to say, "Because this is a life-or-death emergency, I'll be requiring cash up front." Wears Cosby sweaters, the occasional "Rocky Horror Picture Show" costume; and has a haircut that changes with the times. Dr. Hibbert prescribes medical marijuana to Homer. Homer thinks about taking a nap with his head in the ground. You have an absolutely unique genetic condition known as Homer Simpson's Syndrome. You can't let a single bad experience scare you away from drugs. Dr. Julius Hibbert From S12/E20 - Look, a Bear!